Select the free simulator to be used. Converted model will be simulator dependent. Browse or enter the model file to be generated. Suggested extension is .cir or .lib. This generated file will contain .subckt definitions for those converted IBIS model and corners. Browse to select the IBIS model file. After step 3 is completed, all its IBIS model will be available here for further selection. Select the model to be converted here. If parsing is not successful, please see "Support" tab for further info. Make sure at least one setup has been added. User may repeat from step 3 to add other file/model/corner combinations. 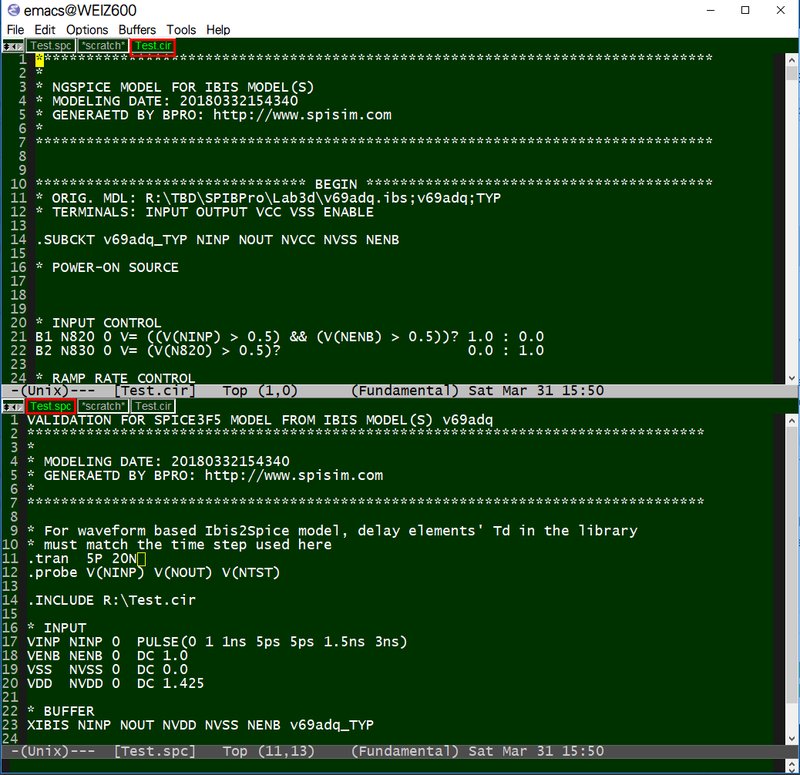 The .spc file is a testbench for you to test drive the generated model using specified free simulator. Output waveform will be in .raw format mostly, which is an open format and can be viewed with free SPILite or like. This free web app converts IBIS model to Spice .subcircuit based on its ramp data, which define 20% ~ 80% of the rising or falling transition slew rate linearly. To obtain more accurate representation of the IBIS model, the I/V and V/T waveform table info. should be used instead. The "Waveform data" based conversion is not enabled in this free web apps. SPISim provides conversion service based on the IBIS's waveform data for $310.00 per model, all Typ/Min/Max corners included. Discount available for multiple models to be processed at the same time. Credit card payment accepted via PayPal. 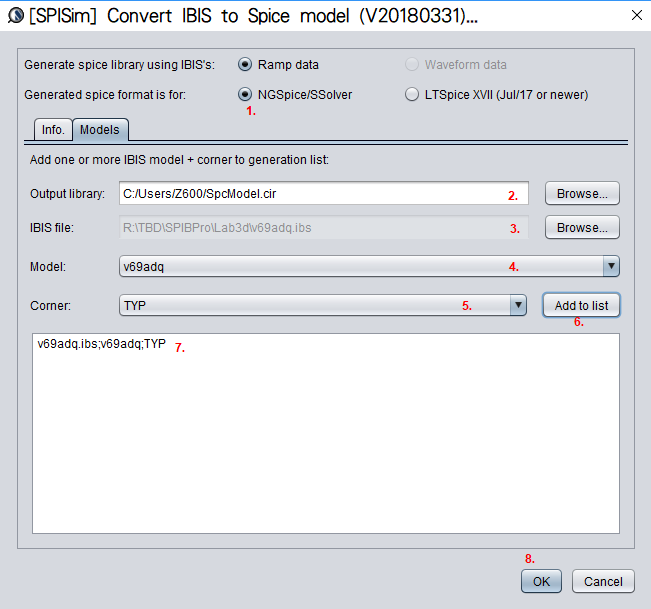 For SPISim_IBIS, the IBIS to Spice conversion tool, the most probable cause of failure is the parsing of user provided .ibs file. When this happens, tool will not index existing ibis models for user to select for conversion. 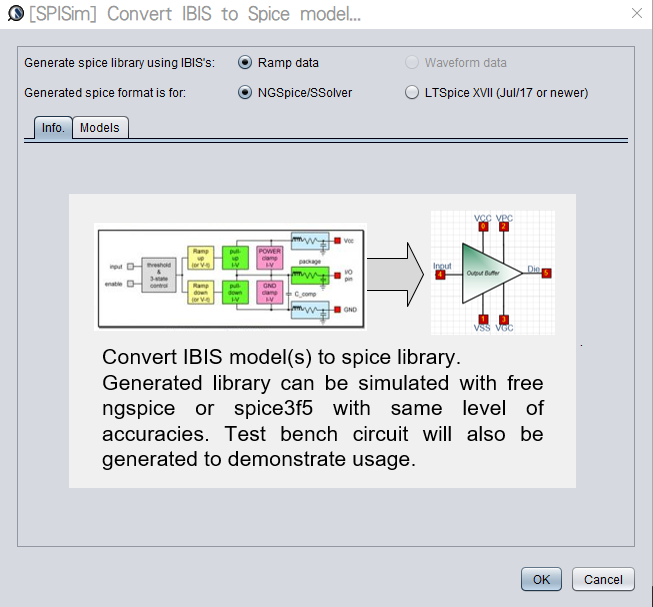 If possible, please send the .ibs file to the SPISim support. When NDA is of a concern, please create a mock-up .ibs model will can reproduce the issue. Free simulators' convergence or usage is beyond our support. Please contact respective companies or organization, such as Analog Device for LTSpice and NGSpice user's forum for further info.